This is the street corner up from my residence. I love the dynamics of line & color. "A transplanted Texan, Ms Crier grew up in the ranching traditions of the Southwest, where her family raised and showed Arabian horses for more than thirty years. Before college she competed throughout the United States, garnering several national awards. Cynthia received her BS in Architecture from the University of Texas at Arlington. She took her BA and Master’s degree in Architecture from Cornell with a minor in Urban Design. She is a registered architect in New York State and is an active member of the American Institute of Architects. ​ Many Renaissance architects studied first as painters. Cynthia reversed that course over the past 7 years, moving instead from architecture to art. Crier’s education and professional career as an architect have given her the basic design principles that she brings to her paintings and photography. She brings that same purpose to her art, the desire to capture the city’s vital moments on canvas. The subject of her paintings and photographs is drawn from her dual passions, architectural built form and natural settings. 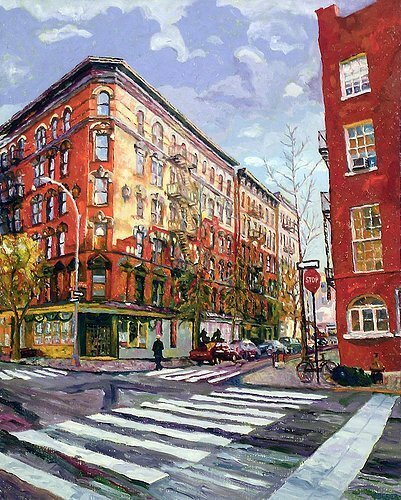 ​ Like a writer, she paints what she knows, ranging from scenes of her West Village neighborhood to landscapes across America. Over two decades as a practicing architect and resident of New York City’s West Village, she has observed myriad changes. The city is organic, and its evolution is accelerating. Like peeling an onion, the layers of a community reveal themselves, one then another, until the whole is exposed. Time, patience and intimate examination bring rich rewards to the persistent explorer. Every day, she discovers new inspiration and old secrets while walking her neighborhood streets. The changing seasons remake each landscape as she explores with camera and canvas."